•Check Upstream Length and click OK. Progress can be followed in the status bar. Large networks will have large topological dictionaries and will take longer to process. •Using a recursive algorithm RivEX is able to sum all the upstream polyline lengths and write the total length back to each polyline. This sum length also includes the polyline itself. 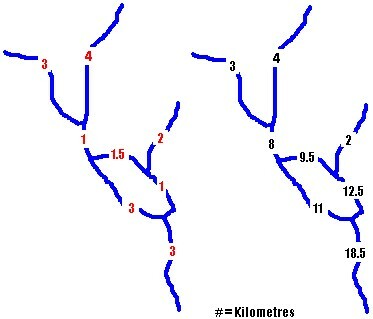 •The output of the summing process is a single field in the attribute table of your river network called US_Accum. 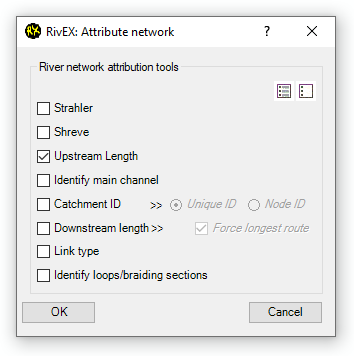 •The image below demonstrates how RivEX deals with braided networks. Red numbers are the lengths of the polyline and black numbers are the accumulated lengths which would be written back to the network dataset.